A Wonderful Thing About My Son’s Autism – Hi Blog! I'm Dad. A while back, I wrote about the difficulty I faced when trying to get my son’s hair cut. Like most parents of children with Autism, I discovered that there was something about this particular activity that sent him into a whirlwind. We tried everything to make it work and, after a particularly rough outing at an “autism friendly” hairdresser”, I declared that I would be doing it myself going forward. It would be me, Lucas, and the buzzer. Let the battle begin. Soon, our sessions turned into buzzcut death matches in the bathroom. He would duck and weave like Muhamad Ali. I would come at him like a spider monkey. We’d wage war one strand of hair at a time and the end result, while not perfect, was better than the ignore-it alternative, which left him looking like Mo from the Three Stooges. It was more than difficult and, as I described it to others, always took a piece of my soul with it. We’d both be pretty mad when it was all over and I just wished there was a way to explain it to him. Being non-verbal, Lucas can’t express what bothers him about haircuts and I can’t detail why it’s important. The two of us just have to show up and get it done. We went through this painful ritual about once a month for years. Then, a few weeks ago, we stopped. No, I didn’t dump hair remover all over him, although the thought has crossed my mind. I still brought him into the bathroom. I still revved up the buzzer. I still cut his hair. None of that changed. The only difference was that now, out of nowhere, he was suddenly fine. The truth of it all is that I begged Lucas for this moment for years. I made unanswered deals and desperately ignored bargains. I’ve done it many times, not just for haircuts, and mostly for my own comedic relief. I’ll often use the ol’ “anything you want, you get” request. I’ll do it when he whines about bed time. Lucas. Listen. Say “No Bed”. Just say it. If you say “no bed”, you never have to go to bed again. Forever. The rest of your life. People will be like, “that’s the boy who doesn’t have to go to bed because he said no bed.” So, go for it. Say it. No bed. In fact, tell you what, I’ll smash the bed with a hatchet right now. Chop, chop. It’s all you. No bed. That’s all you have to say. No? You’re not saying it? OK. Bed. Of course, throughout all of this, I’m zipping up his blanketsleeper and laying out his pillows. He’s smiling by the time he climbs under the coveres. If I’m being honest, though, I would totally follow through on my deal. If my son, who has never spoken a word, said “Yeah? No bed. How’s that?” I’d have to smash it with a hatchet. I know that in my heart and, believe it or not, I’m totally cool with it. That’s part of these tongue-in-cheek deals. So that’s why the haircut thing was a big deal. The way he was acting now was something I would have given the world to have happen a year ago. I promised him everything in exchange for this particular behavior. He could have had ten iPads, a pet pony, or a Lamborghini. These are all bargains I tried to strike in the face of his bloody-murder buzzcut screams. I promised everything and would have given him anything. Yet, here he was doing exactly what I asked, and expecting nothing in return. He was simply doing it to do it. We talk so much about aspects of Autism or raising children like my son that paint it in a negative light. Make no mistake, there are tough times. I’m writing about one right now. However, there are some beautiful and easy to overlook aspects to his personality that are because of Autism. This is just one example. Once again, this thing that is supposed to be detrimental to his personality actually provides one of his most admirable traits. Most people see their good behavior as a bargaining chip. Kids do. Adults do. Everyone does. I’m 41 years old and I’ve said things to my wife like, “I did a good job cleaning the garage out like you asked, huh? Maybe you can go out and buy us some Ralph’s Italian Ices?” I did the job and I earned a reward. I might not have done it for that reason, but I found a way to leverage a deserved prize from my actions. We all do it on some level at some time. Well, almost all of us. My son doesn’t expect a prize for anything. There’s no greed or ego in any of his actions. It just him being him and doing what he needs to do when he is ready to do it. It’s the definition of being true to yourself. There’s something so unique and inspiring about it, that it’s hard to put into words. This may seem like an obvious action to notice now as I point it out, but it’s not. It’s easier to focus on all those terrible haircuts and clashes that made these times so trying for me. I could absolutely miss this wonderful aspect of his character if I did that. To put it plainly, if I just focused on my own needs, I’d skip over the fact that he’s doing the exact opposite. 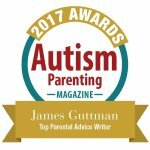 Previous How Can I Raise A Child With Autism?